Citing the controversial “Anderson Cooper 360” report challenging insurers for allegedly mandating shoddy parts to save money, U.S. Sen. Richard Blumenthal, D-Conn., has formally urged the Department of Justice to investigate. In the letter, Blumenthal also sought a federal investigation into alleged insurer “steering” customers to collision repairers with lower rates. “Insurance steering not only undermines a basic consumer right, but can also compromise the safety of vehicles on our nation’s roads,” Blumenthal, who was featured in the CNN report, wrote in the Feb. 13 letter. Blumenthal said many policyholders were misled to think that auto body shops direct repair program or others recommended by an insurer had to be used and questioned the quality of work done at those shops. “It seems to be common knowledge among auto repair shops that the best way to land a coveted shop is not necessarily by delivering consistent, quality service, but by agreeing to charge below-market labor rates and use cheaper, salvaged, used, or even counterfeit parts of questionable quality and safety,” he wrote. Collision repair reaction to the piece was divided, though aftermarket and salvage parts suppliers have criticized it for portraying their products unfairly. Insurance industry representatives on the “AC360” report said no mandate to use certain shops existed and disputed that aftermarket or salvage parts were used for anything but noncosmetic repairs. In the letter, Blumenthal asks the Justice Department to decide if insurers are violating federal law and seeks clarification of whether or not the modern versions of the 1963 insurers are still bound by it. “Consumers and auto repairers possibly remain victims of the very same misconduct insurers were directed to stop doing decades ago,” Blumenthal wrote. 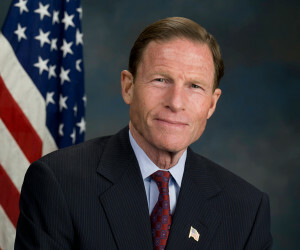 Blumenthal sought a similar investigation in 2009, when he was the attorney general of Connecticut, so whether or not his letter will have any effect this time is unclear. However, the Anderson Cooper piece and the multiple lawsuits brought by state body shops a year before an election might put more pressure on the Justice Department this time.